SkyStream Live TV may be a newcomer, but it’s gaining popularity quickly. Since cable alternatives have been around for quite a while, you might wonder what sets it apart from the rest. 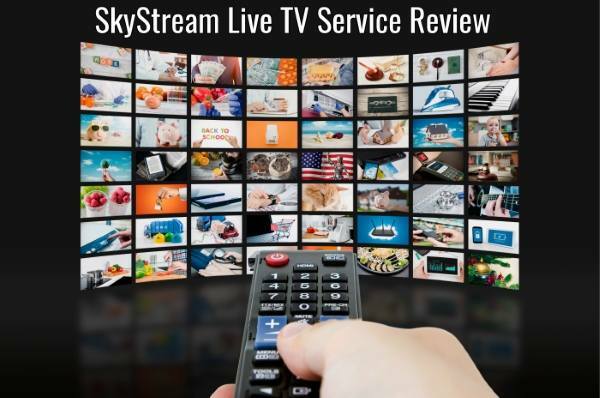 We get up close and personal in this review, but the TLDR is this: SkyStream Live TV is a low-cost, feature-rich live TV streaming service. It offers a solid programming lineup that includes tons of channels not available from competitors in the same sector. Is it worth the monthly fee? We subscribed and spent plenty of time with our feet up, watching on screens large and small alike in order to bring you a thorough review of SkyStream Live TV. Basic SkyStream Live TV service includes a massive roundup of 65+ channels and on-demand content for a single affordable price. The basic cost is $35 per month. That fee lets you stream on just one screen at a time, however it doesn’t limit the number of devices on which you can install and use the app. Roku users can sign into their Roku accounts and then click this link to install the SkyStream Live app. SkyStream Live TV offers a simple month-to-month payment plan. Users can upgrade and downgrade easily, or cancel at any time if they decide that they’re done with the service. We recommend reading the fine print since there are set date parameters for determining when to cancel so that you’re not charged for the next month’s fees. How does SkyStream Live TV work? Installation is easy. Users simply install the app and then purchase the subscription package they want. While it would be nice to do this on your phone or tablet, you must connect to a “main device” before using other devices. According to the company, this has to be a set top box, Roku, or Amazon Fire device. After you connect to that device, you can use other devices / tablets around the house when you subscribe to the multi-screen service. You aren’t limited to home viewing only. You can also use the app to watch TV on your phone or other device while you’re out and about. Essentially, this service lets you watch TV anytime and anywhere you want to, on any screen you have available. Many consumers already have at least one of the primary devices required for service. If you don’t have a qualifying device, you have your pick of quite a few, and most of them are fairly inexpensive. We paid less than $50 for our Amazon Fire Stick. What Do You Get with SkyStream Live TV Service? We were blown away by the amount of content you get for $35, particularly when comparing side-by-side with other streaming TV services. The SkyStream basic service includes 65+ channels, all live as if you were watching them on cable or satellite. Besides the live shows, there’s a huge library of on-demand content. We’ll get to the SkyStream TV channel list shortly – first though, let’s take a look at some additional features that come with the service. To begin with, every subscriber gets a 7-day free trial, which is plenty of time to decide if the service works for them, and if they feel like they’re getting a good value from it. Users who decide it’s not right for them simply discontinue and part ways with the company. Every user automatically receives 50 hours of built-in DVR capacity. There is no separate equipment for accessing your cloud DVR. Once you’ve added a show, you can play, stop, pause, rewind, and fast-forward. You can also skip commercials. We were impressed with the way this feature is setup for convenience: You can add shows to your DVR from the channel guide without having to access a separate menu. SkyStream Live TV has plans to expand its menu options further. For example, subscribers will soon have the ability to record an entire series in a single, time-saving click. Anytime episodes air, they will be automatically recorded for future viewing. Next is the 7-day replay feature, which works with all the channels – even premium ones, and which comes with a user-friendly search menu so you don’t spend a lot of time hunting for shows you wish you would have watched earlier. This feature gives you an opportunity to replay and catch up on shows you missed, even if you didn’t set the DVR. As with the DVR, you can fast-forward through commercials and save a huge amount of time per show. To be honest, we intentionally skipped some of our favorite shows just so we could fast-forward through the commercials with this feature. We saved about 10 minutes per 30-minute show and about 20 minutes per 60-minute show this way. It’s definitely one of our favorite things about SkyStream Live TV. You might be curious about how this works. The company records every show on every channel, which amounts to 11,928 hours of content from 71 channels. This is the equivalent of 429 days worth of content on demand every week. It includes sports, TV shows, movies, documentaries, and news, all of which remain available on demand for a full 7 days after their air dates. SkyStream Live TV offers a huge lineup that looks a lot like a solid cable or satellite TV menu. There are also plenty of movies on demand, and the selection is always expanding. The channel guide shows what’s playing, as well as items that are available for on-demand viewing. Premium Channels are available for add-on, including 2 Cinemax channels, 2 Showtime channels, and 4 HBO channels. This is impressive: there are more premium channels than most other streaming TV services offer, and at a lower cost. If you want them, you can have them all for an additional $25/month. We were even more impressed after we did the math: If you add the premium channels and you have the multiple screen package, your monthly total is $65. It’s quite a steal, particularly when you consider the cost of just one trip to the movie theatre! Not really. Again, comparing side by side with other streaming TV providers, we were impressed at the level of service. We really like the fact that there are no sports blackouts with SkyStream Live TV. If you want to watch a certain game or match, you can do it without paying extra or leaving home. If a channel carries an event, you get to watch it. If you want to watch NFL on your mobile phone or tablet, you can do it, even when games air on ESPN. Some streaming TV services charge their “power watchers” more, and some have watching limits. SkyStream puts no such limits on its subscribers. You can stream live TV anywhere on any screen and leave it on 24/7 365 days per year if you want to, and no one will care. SkyStream’s licensing agreement does not allow for local broadcasting, but this is nothing new in the live TV streaming sector. All the major networks – NBC, CBS, FOX, ABC, and PBS – are broadcast out of New York and New Jersey. These channels run on Eastern Standard Time. The service gets around this potential drawback easily, as the cloud DVR and replay features ensure no one misses a minute. Viewers in any time zone can watch whatever they want to, whenever it’s most convenient. It would be nice if SkyStream Live TV service were available internationally, but it is only accessible to United States consumers at this time. We weren’t able to find out whether there are plans for expansion. Is SkyStream Live TV Service worth the money? In a word, yes! So far, this service is giving us everything we want in a TV provider, outpacing other streaming services by leaps and bounds. We feel like we’re getting plenty of value from it particularly since it’s costing us less than our daily coffee habit. We are definitely in the “keep” camp! Of course, this is our opinion. You can sign up for the 7-day trial and decide if it it’s the right solution for you. Binge watch like we did. Whether you keep SkyStream Live TV service or not, you’re probably going to enjoy the week ahead. hello will the skystream work on any android box.i have 16.1 jarvis element android box.thankyou.